Vladimir Putin continues to unsettle Europe's economy. The latest: Farmers in Europe will be paid to destroy or give away fruit and vegetables to stop prices from collapsing after Russia banned imports in retaliation for Western sanctions. EU officials said Monday they were setting aside 125 million euros ($167 million) to compensate producers for not selling a range of perishable items, harvesting them before they ripen or leaving them to rot. "This is a measure aimed at reducing the level of supply so the prices don't drop to crisis levels," said European Commission spokesman Roger Waite. 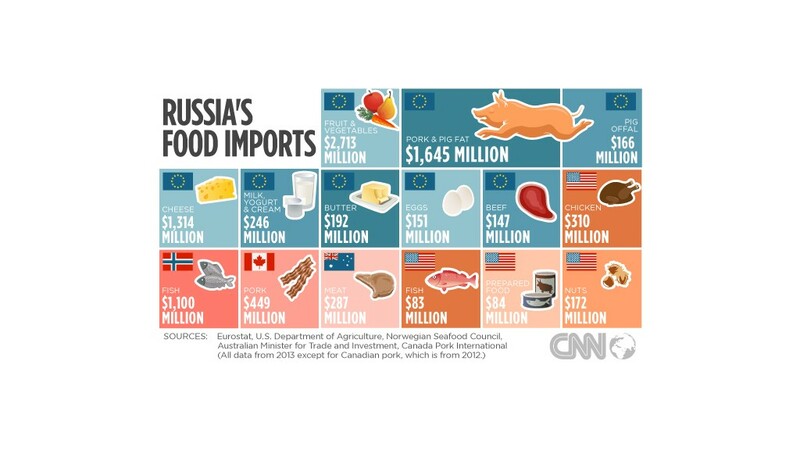 Russia hit back at the latest round of Western sanctions over Ukraine with its own year-long ban on imports of food from Europe, the U.S., Australia, Canada and Norway. The emergency assistance will take effect immediately and run until November, under existing EU rules covering support for farmers' incomes in times of crisis. The products include apples, pears, tomatoes and cucumbers, and are all in full season. Farmers have few options to store them or find alternative markets, and prices for some products have already fallen by more than 50%. EU exports of fruit and vegetables to Russia were worth about $2.7 billion last year. Countries hardest hit by the Russian ban include Poland, Spain, and Lithuania. EU officials hope much of the withdrawn produce will be given away for free -- to food banks, prisons, schools or hospitals -- but some will be left on trees or in the ground, or harvested early and then destroyed. European farmers and food cooperatives welcomed the move but warned that the Russian ban could cause long lasting damage to the sector, and the cost would be much higher than the money earmarked for support. Officials will continue to monitor food markets, and could provide support to producers of other foodstuffs as needed. -- CNN's Ivana Kottasova and Inez Torre contributed to this article.